All new improved formula, with more CBD! 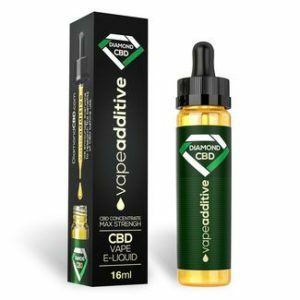 Diamond CBD Vape Additive CBD Concentrate Maximum Strength 16 ml CBD oil vape additive can be used in all vaping e-liquids. The best CBD concentrate additive for vape juice. Diamond CBD Vape Additives are produced using the highest quality 100% natural hemp. Diamond CBD Vape Additive is made with top quality CBD oil made from organic industrial hemp. Vaping CBD enriched e-liquid is a great method to get your daily dose of CBD! 16ml bottle with 600mg CBD.